Often, we express our emotions less through what we say and more through how we look. Facial expressions are very important for expressing emotions. Note the many different emotions you can see in these facial expressions. 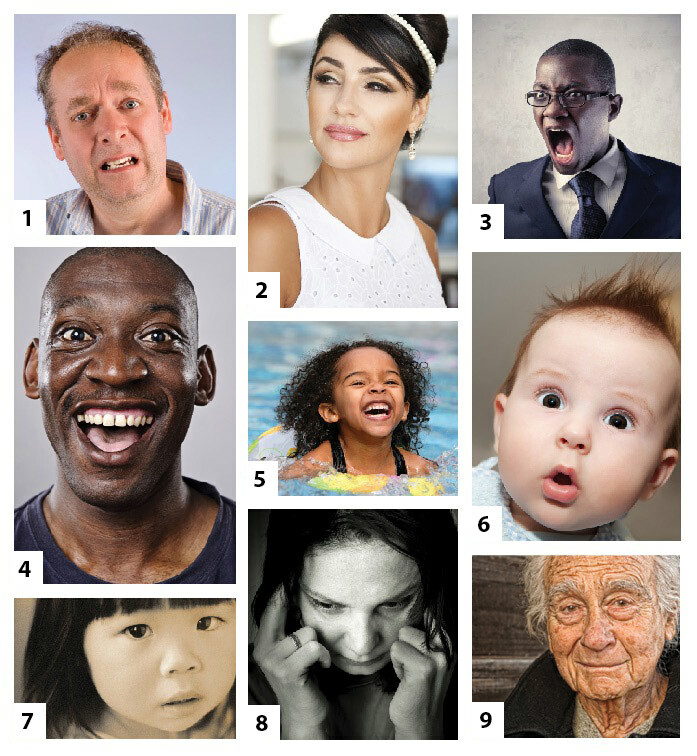 This activity will help you guess at the emotions behind different facial expressions. Your Turn Match emotions to facial expressions. For each picture above, write down the number and a word that describes the emotion that the person is showing. After the word, write some of the facial features that clue you in to the person's emotion. Compare your answers with a classmate's and discuss what you are seeing in the expressions. Your Turn Show emotions with facial expressions. Find a partner. Choose one of you to start as the person showing an emotion with a facial expression. Have the other person guess at the emotion. Discuss the clues that revealed the emotion. Switch roles and repeat. Your Turn Pay attention to facial expressions. Throughout the rest of your day, notice the facial expressions of those around you. Silently in your own head identify the emotion that the person may be feeling. Try to remain mindful of others' emotions throughout your day. Seeing Emotion in Facial Expressions by Thoughtful Learning is licensed under a Creative Commons Attribution-NonCommercial-ShareAlike 4.0 International License. Based on a work at k12.thoughtfullearning.com/minilesson/seeing-emotion-facial-expressions.